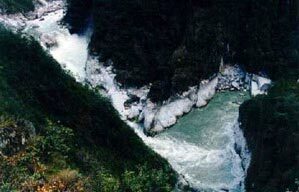 Rivers that qualify for listing at this site are limited to whitewater stretches which have not previously been run by anyone, including local Chinese residents. East of central Sichuan, the Chinese have used most rivers for transportation for centuries, including mild whitewater stretches such as the Min River north of Chengdu and the Yangtze north of Kunming, Yunnan. Boating these stretches does not qualify, even though there is no public record of the first descent. If you believe you have run a first descent of a river that is not listed, please contact us. Many rivers in western China have been surveyed by Chinese geologists in motorized Zodiacs for potential dam sites since the mid 1980's, but they portaged most or all of the rapids. These stretches qualify for listing as first descents if the rapids are run, except for those which cannot be safely run. A couple of American kayakers snuck into Tibet and ran the Yarlung Tsangpo from Lhatze to Lhasa in 1986. It wasn't until 1998 that Chinese rafters completed a first descent from source to Lhatze, then from Lhasa to the Great Bend. While this team was hiking the Great Bend to photograph Hidden Falls, an American team attempted to kayak the Great Bend on the tail end of a flood, making 27 of the 60 miles before one of them drowned. At low water in February of 2002, an international team ran another 17 miles in a gala event sponsored by Chevy Avalanche and Outside Magazine. Tibet is known as Khawachen, " Land of Snows ," "Shangri-la" or "The roof of the world." From most descriptions of Tibet it is hard to believe that Tibet is home to a large number of spectacular rivers. Mt Kailash, in the west of Tibet is the source of the subcontinent's four greatest rivers: the Ganges , Indus, Sutlej and Bramaputra. In the east, the forested land of Kham is home to the source of the Mekong and the Yangtse, the 2 largest rivers in East Asia . In the summer months regular rains swell Tibet 's rivers and the result is a surprising number of world class rafting and kayaking rivers. Adventure Silk Road Inc. has pioneered rafting and kayaking trips across Tibet and has unique access to permits allowing guided rafting and kayaking trips. We have employed international guides who work along side our Tibetan guides to ensure a very high standard of safety, service and cultural experience. We run a variety of trips that combine some of the striking cultural visits in our general catalogue with rafting and camping in areas of overwhelming beauty. We also have the ability to suggest, guide and handle logistics for first descents by experienced kayakers or rafters. 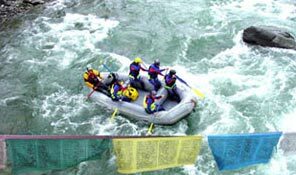 We regularly run 6 different rivers in the Central Tibetan area, ranging from relaxing float trips to challenging Class IV white water. We offer short trips based out of Lhasa and multi-day expeditions to wild rivers in remote regions of Tibet . We can combine a rafting adventure with any trekking or cultural tour from our general catalogue. Simply let us know what kind of adventure you have in mind and we will prepare an itinerary to suit your needs. Adventure Silk Road Inc. has established itself as one of the most comprehensive adventure tourism company in Tibet . Our reputation is based on honesty, reliability and a high level of service and safety. All our international guides are trained in wilderness first aid and river rescue. Expert safety kayakers are used on every run except our float trip on the Lhasa river (where there is no whitewater!) They have extensive experience running challenging whitewater expeditions in the Himalaya and elsewhere. Our international guides have years of experience guiding, instructing, and managing rafting and other outdoor adventure operations around the world. 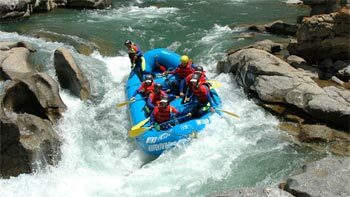 Our rafting guides and safety kayakers come from several years experience running rivers in Nepal. All clients are provided with international standard safety equipment including a full wetsuit, helmet and buoyancy vest. We use state of the art rafts, kayaks and equipment. When we design your itinerary we consider seasonal weather patterns, water levels and temperatures, altitude, accessibility, as well as surrounding scenery and cultural sites to ensure that you have the best possible experience on the water. Travel in Tibet can be challenging; however, the moment you arrive, Adventure Silk Road Inc. will make every effort to ensure your journey in Tibet will be a fascinating, fun and rewarding experience.